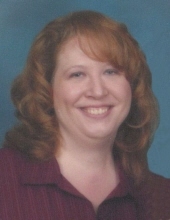 Deborah Ann Hammer, 48 of Fostoria, passed away at 3:50 am Wednesday morning April 10, 2019 at Mercy Hospital Tiffin, surrounded by her family. She was born July 13, 1970 in Fostoria. Her father Robert G. Hammer passed away February 20, 2019 and her mother Janice M. (David) Hammer survives in Fostoria. Also surviving is brother; Anthony R. Hammer, sister; Angela M. Hammer and brother; Michael A. Hammer all of Fostoria. Deborah enjoyed watching TV especially, M.A.S.H., Project Runway, and Top Chef. She was a faithful blood donor and an avid cross-stitch and quilter. Deborah is a member of All Saints Catholic Parish and a former member of St. Patrick’s, Bascom and St. Michael the Archangel, Findlay. Visitation is Monday April 15, 2019 from 4-8 pm at HOENING & SON FUNERAL HOME 133 W. Tiffin St., Fostoria and Tuesday from 10-11 am at All Saints Church, Bascom. Funeral Mass is 11 am Tuesday April 16, 2019 at All Saints Church, Bascom with Rev. Timothy Kummerer presiding. A luncheon will immediately follow the Mass in the church basement. Burial will be in St. Andrews Cemetery, Liberty Twp. To send flowers or a remembrance gift to the family of Deborah Ann Hammer, please visit our Tribute Store. "Email Address" would like to share the life celebration of Deborah Ann Hammer. Click on the "link" to go to share a favorite memory or leave a condolence message for the family.